Glass has endured as an art medium for centuries. Its transparent and crystal-like qualities have inspired the careful creation of the stained glass windows of Medieval Europe as well as the dazzling glassware in your kitchen cupboard. Glass is both practical and beautiful, simple and complex, and Dale Chihuly made it his life’s work. Seattle's Chihuly Garden and Glass is a monument to glass as art and features a large portion of Chihuly's work. The long-term exhibition, open since 2012, features a Glasshouse, an Exhibition Hall containing eight galleries and three drawing walls, and a lush garden that serves as the backdrop for glass sculptures made up of impossible shapes and unbelievably brilliant colors. If Seattle's famous overcast skies leave you feeling washed out, then Chihuly Garden and Glass will surely add a splash of color to your day. Chihuly Garden and Glass is a lesser known diamond in Seattle's long list of major attractions, but those who go know it can't be missed. What makes it such a gem? Well, for starters, Chihuly Garden and Glass lives at the Seattle Center, almost right at the base of the Space Needle, Seattle's most recognized attraction. Some people visit Chihuly Garden and Glass as a way to kill time waiting to ascend Space Needle, but often, they are the ones even more impressed by the magnificence of the museum. It's not #1 on TripAdvisor's list of things to do in Seattle for no reason. The sheer scope of the glasswork is something you'll gawk at, and the colorful displays will give you something to talk about for days. Chihuly Garden and Glass is open daily, with hours varying by season. Usually, the museum is open from 8:30am to 8:30pm Monday through Thursday and stays open until 9:30pm Friday to Sunday. Check their website for event-related closures and schedule changes and to purchase tickets in advance. If visiting before 10am, you can save up to $10 and enjoy an early morning stroll through the garden. Admission is $18 for children ages 5 through 12, $22 for seniors, and $29 for ages 13-64. Children 4 and under are free. 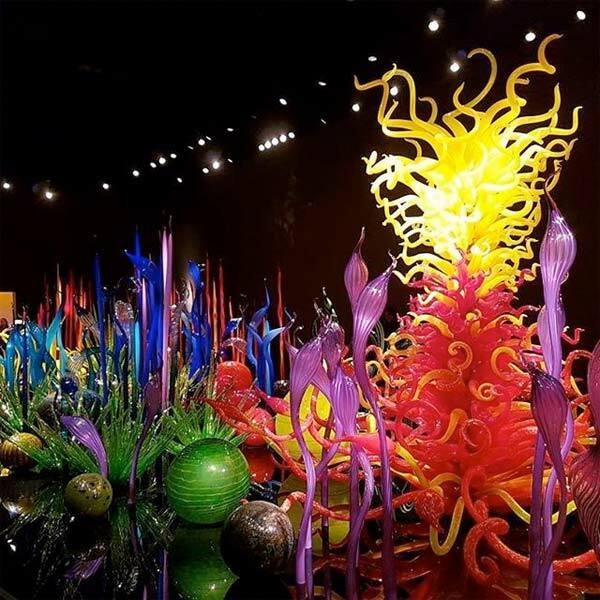 Chihuly Garden and Glass also offers package deals that include admission to the Space Needle, but Seattle CityPASS is the best way to save money and see more of Seattle's best attractions without paying separate admission every time. 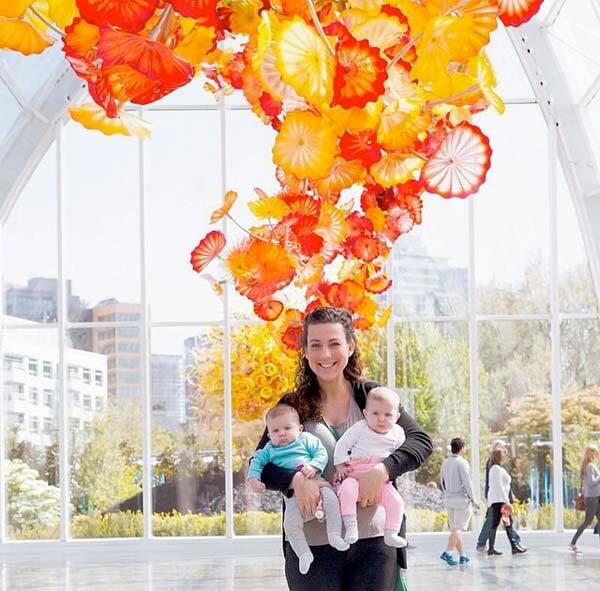 With Seattle CityPASS, booklet holders will see either Chihuly Garden and Glass or Pacific Science Center, the Space Needle, the Seattle Aquarium, the Argosy Cruises Harbor Tour, and either the Museum of Pop Culture or the Woodland Park Zoo. Five attractions packaged together for $79 (a 51% savings), plus little bonuses with each attraction. Though the glass is beautiful inside the galleries year-round, the garden is at its most spectacular under sunny skies. 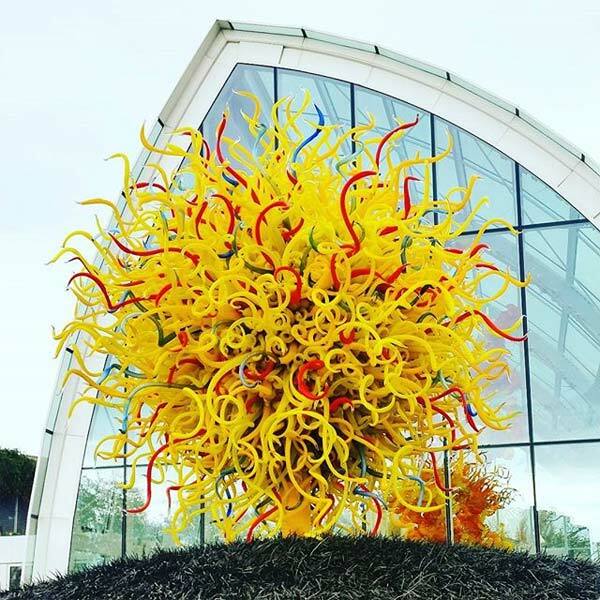 Try to plan your Chihuly visit when the sun is out. The reflectivity of the glass will make the works pop even more. However, the museum is an entirely new spectacle at night when the glass in the garden is lit up against the dark sky. If you only have time to tour the museum once, plan your visit close to sunset so you can see the moving sun transform the glass. Chihuly Garden and Glass offers an audio tour that you can access on your smartphone for free. As you enter each room, take a picture of the QR code near the entrance and listen to stories from Chihuly and his team on how and why each piece of art was made. The audio tour takes your glass exploration to new heights by telling you the secrets behind the inspiration and meaning of each work of art. Chihuly Garden and Glass has pleasantly surprised visitors time and time again. Understandably, kids under the age of 14 must be accompanied by an adult, but that doesn't mean the intricate and delicate museum isn't a great place to take the kids. 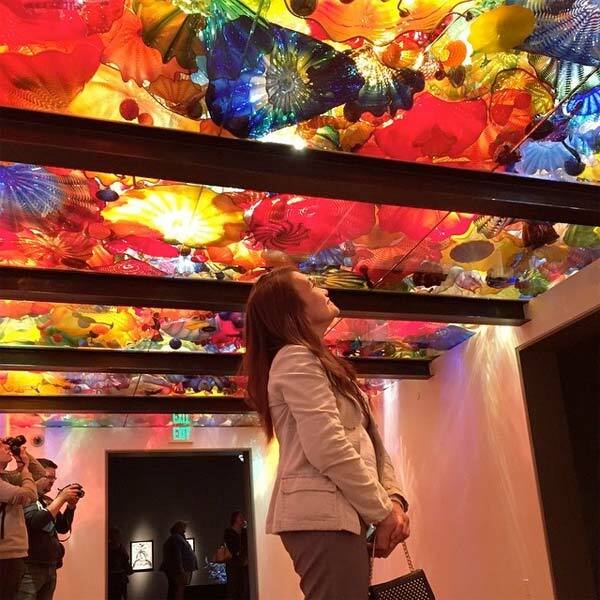 In fact, such spectacular colors will leave kids just as impressed as the adults, meaning that everyone gets a chance to enjoy the glass works. Though most people spend one to two hours on average, there's so much to see and no time limit, so you can stare at the sculptures for as long as you'd like. Nature and art are perfect partners and the Chihuly Garden is no exception. Camellias in shades of crimson, dogwoods, scarlet daylilies, and fuchsias add a soft pop of color in the lavish green of the garden. There are icicle towers throughout the garden, and smooth glass spheres that reflect the Space Needle towering overhead. Chihuly wanted his art to complement nature and vice versa. The attention given to each piece in design and color palette make each work of glass seem as if it were just a wildflower itself. The Glass Forest is a phenomenal gallery that showcases the ingenuity of glassblowing. The delicate shapes and glowing colors of the sculptures in contrast with the black gallery space will leave adults and children in awe of what feels like a first-hand exploration of another planet. An overhead flat panel of glass contains an assortment of backlit pieces that resemble a swarm of jellyfish, but with more variety in color, hue, pattern, and shape. The light above shines through the glass leaving rainbow reflections along the walls. This space is a great example of Chihuly's creative design. Immerse yourself in a glass ocean without having to swim. The Pacific Northwest was a big inspiration for Chihuly, who grew up here, and the 20-foot tall sea life tower embodies the colors of the sea and contains hidden treasures such as starfish and seashells that both adults and children will have fun spotting. The float boats are an explosion of color contained within the space of a boat. One boat contains an array of spheres, each glass piece with patterns and colors that make the boat look like it were holding in an entire universe. The other boat is a sparkling combination of swirling, thin glass and odd shapes, like a burst of confetti. You'll want to know more about the process of blowing glass after visiting these exhibits. The Theatre presents short videos about Chihuly, his working process, and the art of glassblowing. The Theater is also used for lectures and community events and is a great educational facet of the museum. If you want to learn more about Chihuly's work, the Bookstore has a great collection of books and materials that delve into the artist's artworks and projects. The Bookstore offers other items that complement the creativity that thrives in Seattle.